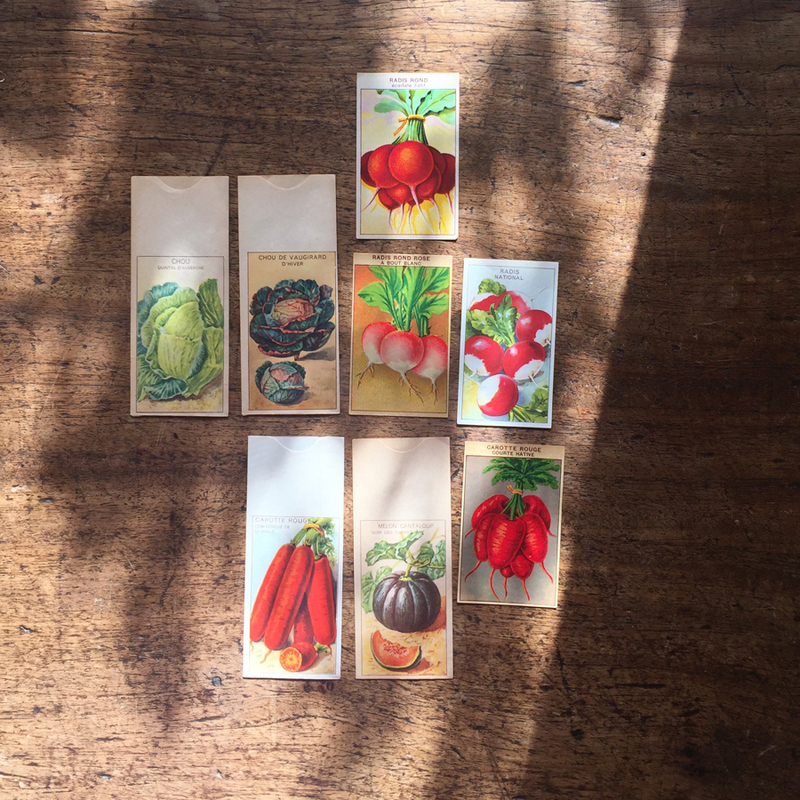 Recently, a special commission to create an artists' book landed upon our working table, and we accepted, with glee, the chance to cut and glue with such handsome source material as French seed packets and a bushy-tailed Hormiguero from an 1852 edition derived from Buffon's Historie Naturalle. And now that this special one-of-a-kind Parisian memory folded as a concertina has been delivered to its new home, we can show you the richly coloured source material the honeybee scissors have been negotiating of late. With a petal for a hat, a leaf for an umbrella, and a shell for a bed, from the paper sleeve of Grandville's Les Fleurs Animées, a cover was fashioned. A cover replete with a platypus, whose edges were softened with a 2B pencil, as our cat, Olive, looked on. 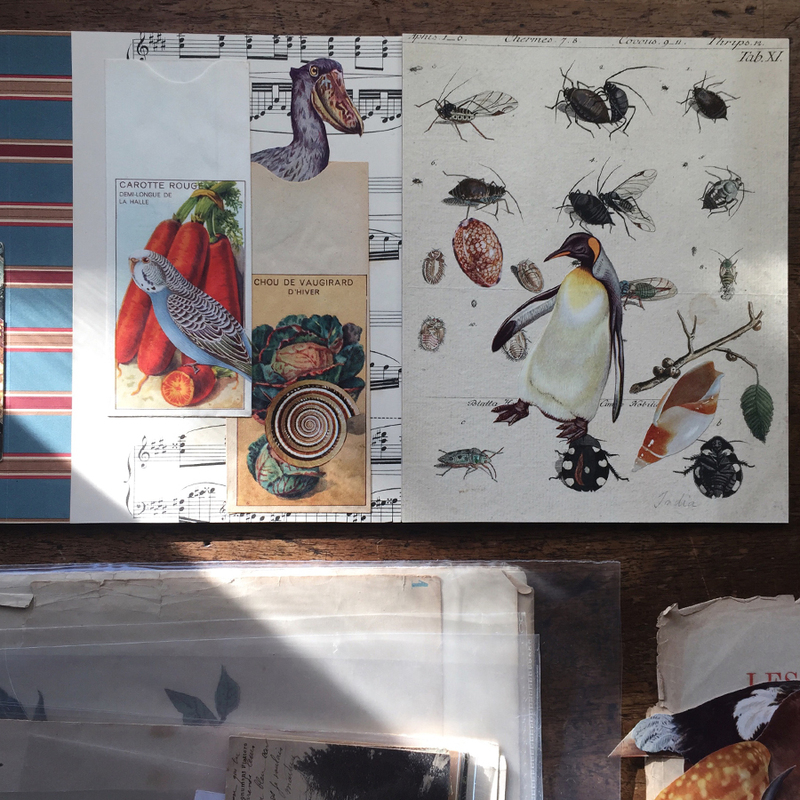 To create a collaged Ménagerie du Jardin des Plantes upon the page, an original plate from Roemer's Genera Insectorum, a Swiss publication on entomology, was called upon. To the hand-coloured plate, drawn and engraved by artist and entomologist J .R. Schellenberg, a penguin now (forever) glides. To a colour chart of nectar, a butterfly was added, and to Ravel, a Giant anteater now saunters, scrambling, for book's lifespan, the musical notes with their long claws. 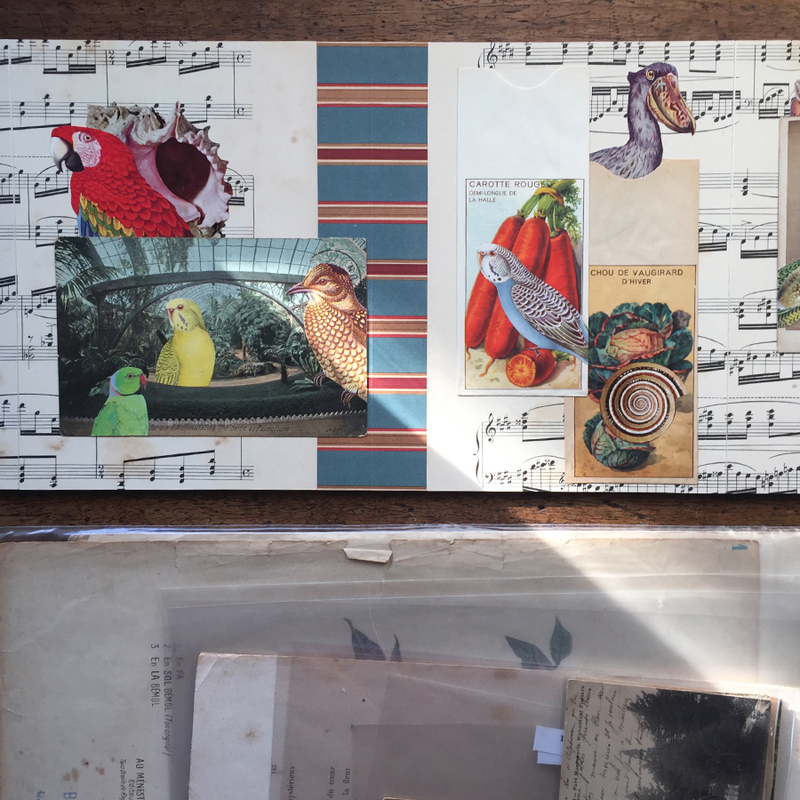 To collectible scenes, red and blue tail feathers were placed to follow the lines in the wallpaper's design, and luminous radishes grow from beds of sheet music, which also provide a budgerigar with a perch. The delicious delicacy of the original pieces was both terrifically daunting and an honour to work with. An artists' book as an echo of a trip, six-pages in length and composed from a collection of such bright treasure, this truly was a wonderful and unique commission. In our haste to deliver A Souvenir of Paris, these are the only image we have of the work, but you get the idea. 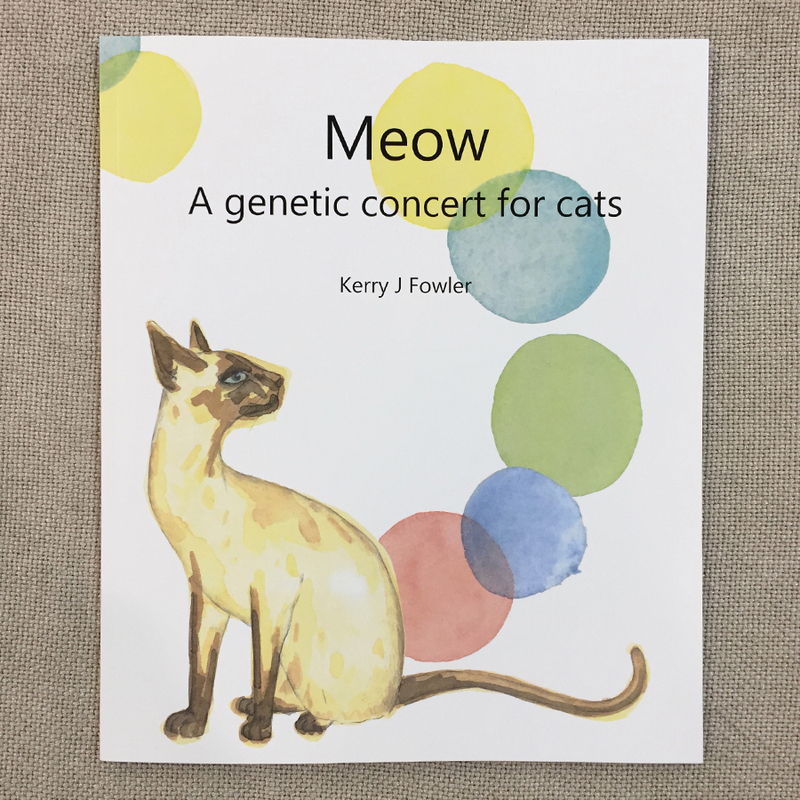 From the Jardin des Plantes to chromosomes, genes, and alleles, we have recently also had the pleasure of working on the cover illustration for Kerry J. Fowler's book, Meow: A Genetic Concert for Cats, which looks at the DNA responsible for the diversity and appearance of cat breeds. 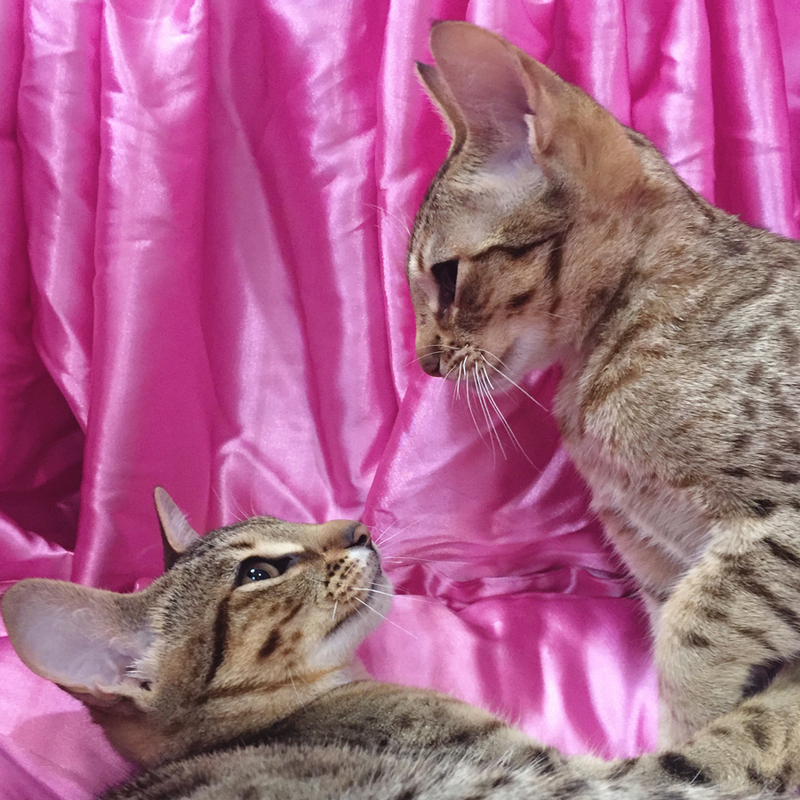 In a clowder of cats, and to purrs of delight, the book was successfully, suitably launched at the 45th ACF National Cat Show, held in Diamond Creek. For the cover, Louise drew a Siamese cat, in the spirit of Omar, and in reference to Lenni, too, "whose pattern was one of the first feline genes to be decoded." Tickled, Spotted, and Mackerel tabby to Gold glitter and bi-metal, by way of Ghost tabby markings, Chapter 4 covers coat pattern, length and composition, and it reads not unlike a fantastical palette. Indeed, the book is for "those of us who are curious about the genetic makeup of cats," and what splendid cats there were to learn about at the launch and to see at the show. On the page and before satin backcloth, thanks to Peterbald No. 196 (Black Spotted Tabby female), Snowshoe No. 352 (Seal bi-colour female), Tonkinese No. 359 (Seal Mink male), and all of the clever, clever cats, it was wonderful to play a small part in this whiskered publication.